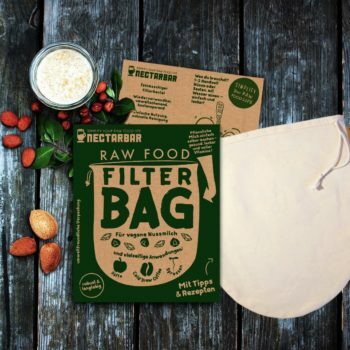 NECTARBAR - Raw Food Filter Bag - Eco Nussmilchbeutel aus Deutschland / Nut Milk Bags - Made in Germany | Simplify Your Raw Food Life! The Nectarbar-Family cares about a healthy nutritious lifestyle and we are ambitious to spread this message to every single individual around the globe. Stay healthy, happy and creative! Our original, handcrafted filter bags are now all made locally in Germany from pure cotton and linen. These bags are not only totally natural but easy to use, to clean and perfectly handy for making nut milk and more. For us, everyone is equally important, therefore we aim to work in a collectively, fair and honest way. We also warmly welcome you to the Nectarbar-Family! Find out more about the project and » HOW TO ORDER «.